Dryopteris felix-mas 'Linearis Polydactyla', a jurassic tongue twister of a name, but this unusual form of our native ‘Male Fern’ has the most filigree fronds of just about any fern. Plants are clumping in habit, the fronds are long and arching but very delicate and skeletal in appearance, despite the large size. Well suited to use in any moist, shady situation. Also useful intubs or mixed containers, combining beautifully with bolder-leaved plants, such as Hostas or Hellebores. Deciduous in habit, remove old fronds in late autumn or spring. 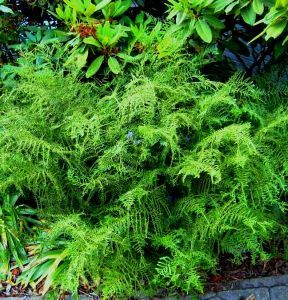 Ferns are very easy to grow given a shady spot and the some soil moisture. These varieties are happy on most soil types.Whilst Ferns can grow in some sun, the best position is where they only get the morning sun. No real maintenance is required, but the deciduous ferns can have the faded fronds cleared in February to make way for the new growth, and even the evergreen ferns lay down the previous year’s fronds which can be cut back again to allow the new growth to shine through.